What are Aerosols or Particulate Matter (PM)? Aerosols are liquid or solid particles suspended in air. They include smoke, bacteria, salt, pollen, dust, various pollutants, and tiny droplets of water. What are sources of aerosols? Globally, most aerosols are from natural sources like desert dust, sea salt, volcanic ash, and smoke from forest fires. These may be emitted in remote regions far from people. However, there are also sources associated with human activities such as road dust, fossil fuel combustion (for energy, industry, and transportation), and agricultural or domestic burning. Aerosols can be directly emitted (like dust) or can be formed in the atmosphere (like sulfate). Aerosols from human sources are generally smaller than from natural sources. In the video to the right, we see aerosols from many different sources being transported around the globe: dust (red), sea salt (blue), organic/black carbon (green), and sulfates (white) are displayed by their AOD.This simulation used GEOS-5 and the Goddard Chemistry Aerosol Radiation and Transport (GOCART) Model. More information here. What are PM2.5 and PM10? Particulate Matter (or aerosols) with a diameter less than 2.5 micrometers or 10 micrometers. While 10 micrometers may still seem small, this includes “coarse” aerosols like suspended dust. PM2.5 is considered “fine” aerosol and is more associated with negative health effects because they can penetrate deep into the lungs (rather than just getting caught in your nose or mouth!). We use PM2.5 or PM10 when discussing surface-level (or “breathing-level”) aerosol concentrations. What are typical PM2.5 concentrations? Well, that depends on where you live. In the US, we generally have annual average concentrations in the range of 5-15 µg m-3. Daily concentrations can be much higher, for example, during wildfires, when concentrations can be greater than 100 µg m-3. In some cities in China, annual average concentrations can be greater than 100 µgm-3 and daily concentrations of over 1000 µg m-3 have been measured. What are the human health effects associated with PM2.5? There are many negative health effects associated with breathing in particles. These effects can be short term, like coughing, sneezing, itchy eyes, or needing to use an inhaler. Long-term exposure to poor air quality is associated with more serious health effects like lung cancer, heart and respiratory diseases, stroke, and death. The World Health Organization (WHO) estimates that worldwide, 7.3 million deaths per year are due to people breathing in polluted outdoor and indoor air (source: WHO)! Aerosol optical depth is also called “aerosol optical thickness” (AOT). Optical depth is a measure of how much light does not passes through a material (in this case, the atmosphere), greater optical depth means less light makes it through. Aerosol optical depth is the amount of sunlight that is not transmitted because of aerosols (it is either scattered or absorbed by the particles); we call this “extinction”. We often use AOD as a measure of all the aerosols in the atmospheric column (as opposed to just the concentrations at the surface). There are ground-based measurements of AOD, but we also measure AOD from satellites. What are “normal” AOD values? In a very clear sky, AOD can have values of 0.05 (about 95% transmission) or less. When the sky is very hazy or smoky, AOD values can be greater than 1.0 (about 39% transmission). Again, what is normal depends on where you live! Why are we measuring AOD and PM2.5? PM2.5 is the aerosol concentration at the surface and is the value we care about for discussing human health. AOD is a measure of all the aerosols in the atmosphere. These two values are related, and lots of research has been done to try to use satellite measures of AOD to estimate surface PM2.5 concentrations in regions without a ground-based measurement of PM2.5. These concurrent ground-based measurements of AOD and PM2.5 help connect the “seams” between the satellite measurements and surface air quality. However, while these two values (AOD and PM2.5) are related, the relationship is not consistent in time or space. There are a variety of reasons, but here is one simple example: A satellite can measure two different columns of the atmosphere that have similar total aerosol concentrations, but different ground-level concentrations. The AOD value *may* be similar, but the PM2.5 concentrations are different. If we want to use satellites for surface air quality, we need to better understand how this AOD-PM2.5 relationship changes in time and space. A photometer measures light intensity. For this project, we are using sun photometers which measure the light from the sun. We use four different wavelengths (440, 520, 680, and 870 nm), which can help us determine the relative size of aerosol particles. Why do we measure AOD at different wavelengths? 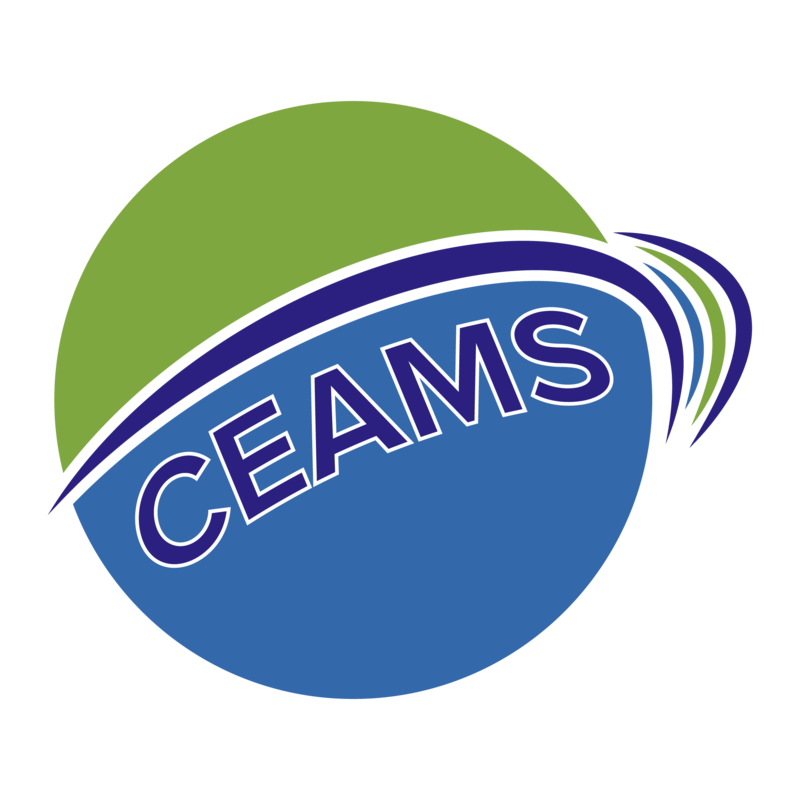 The CEAMS instruments measures AOD at four wavelengths of light: 440 nm (blue), 520 nm (green), 680 nm (red), and 870 nm (solar infrared). Particles, cloud droplets, and ice crystals in the atmosphere scatter/absorb sunlight differently as a function of their size. Hence, we can learn about the size of particles/droplets/crystals in the atmosphere above us by looking at how AOD varies between the our four wavelengths. Fine particles (PM2.5) will have decreasing AOD values with increasing wavelengths (i.e. blue AOD is larger than green AOD and so on). For fine particles (such as wildfire smoke aerosol), we might expect the blue AOD to be around four times larger than the infrared AOD. On the other hand, coarse particles (too large to be PM2.5), cloud droplets, and cloud ice crystals will have similar AODs between all four wavelengths (within ~20%). A metric that atmospheric scientists use to quantify this change in AOD with wavelengths is the Angstrom Exponent (AE). An AE that is below 1 (including negative values) means that AOD is similar across wavelengths. These low AE values are indicative of coarse particles, cloud droplets, and/or cloud ice crystals in the atmosphere. An AE around 2 or larger (maximum value of 4) means that AOD decreases strongly with increasing wavelength. These larger AE values are indicative of fine particles in the atmosphere. If AOD is high and similar across wavelengths (AE below 1), this may mean that thin clouds have contaminated the AOD measurement (clouds may be contributing too much of the optical depth, so it isn't really *aerosol* optical depth), and we should use caution with these data. However, an exception is when high loadings of dust or sea spray (in coastal regions) are in the atmosphere, which can lead to similar results, and this optical depth is actually from aerosol, not clouds. Why are we using filter-based PM2.5 measurements? We want to know the mass concentration because that is what health studies use to link to health effects. However, there are different measurement techniques which can be used to estimate surface-level PM2.5 mass concentrations. Optical measurements (like AOD) can be used to infer concentrations, but you need to make more measurements or make assumptions about the size and composition of the particles and the relative humidity. We can simply weight the filters to determine the mass with very few assumptions. Why do we need cloud-free AOD measurements? Cloud droplets can also scatter or absorb light and, therefore, have an optical depth. In general, cloud optical depth is much greater than aerosol optical depth. It can be difficult to separate out the contribution to light extinction of aerosol from cloud, so we want to take our measurements in cloud-free sky. Why do we care about relative humidity? First, relative humidity is a measure of the amount of water vapor in the air. It is given as a percent and depends both on the temperature and pressure. We care about about the amount of water vapor in the air for this project, because it can impact AOD. Some particles take up water; the greater the relative humidity, the more water they can take up. These aerosols “grow” and scatter more light, leading to a greater AOD. Water on aerosol particles can also impact the mass concentrations. However, the effect on PM2.5 mass concentrations is less, because filters are usually dried to 35% relative humidity before being weighed. To let you know what your air quality is. For scientists to learn more about air quality in general. We can combine all of the measurements taken to better understand regional air quality and how it changes in time and space. The researchers also hope that the information gained will then give us all a better understanding of air quality globally.